I had taken an Aleve before we left the house which enabled me to make the 1 1/2hr drive to my sons. We were going over to visit for a few hours. 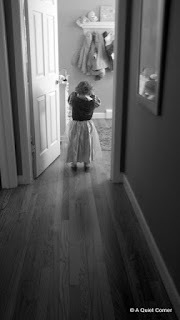 As we pulled up to the house, there they stood...in the doorway...my son and his little girl...a perfect picture. As I got out of the car, she shouted, "Nana," which was perfect! I couldn't wait to get inside and visit with Mia. She told me how she got the black and blue on her forehead at the birthday party the day before and about what she's been doing in daycare. I saw her ABC cookie shaped letters sprawled out on the family room floor as she belted out the ABC's. As we colored, she said, "tell me another adventure. " In fact, each time I would refer to her coloring so beautifully, she would simply dismiss it and say "tell me another adventure, Nana." I always fill her in on the things I've been doing and she seems to love it when I give her the option of choosing an inside adventure or an outside adventure. Spellbound by my tales of squirrels, chipmunks, dogs and hawks seemed to make her mind soar. The look on her little face was of total amazement and she waited for yet another story. And so they continued all while we colored. At the age of three, she's like a little whirlwind. Next we bundled up to go outside. While she scaled the rock wall of her Little Tykes playhouse, I waited on the other side. She then announced boldly that she was "Jake," had a green parrot on her arm named "Scully" and that I was Cubby. Her Mom was Izzy. And so we entered the pirate world. Spying two branches on the ground, I handed one to her and said "let's see if we can catch a fish from our pirate ship." The first one she pulled in was a balooga whale, she said. Then we again cast our invisible lines into the deep blue sea hoping to land a shark. She of course, caught one. Cubby (me) didn't. But the highlight of the day was when Sleeping beauty walked down the hallway and said, "Nana, I was tricking you. I'm not Sleeping beauty yet. I forgot my crown." Scurrying back down to her room to get her crown, she reappeared as Sleeping Beauty, a far cry from Jake, the pirate! Before long, it was time for Sleeping Beauty to retire to her bedroom for her afternoon nap. Goodnight Beauty...sleep tight..I love you. They are such fun at that age and their imaginations are beyond belief. Good for you for encouraging imaginative play. this is a sweet sweet story. I love sleeping beauty and cinderella. You are so blessed. What a wonderful age she is, discovering the world around her and the world of imagination. what an adventureous mind! I love that age!